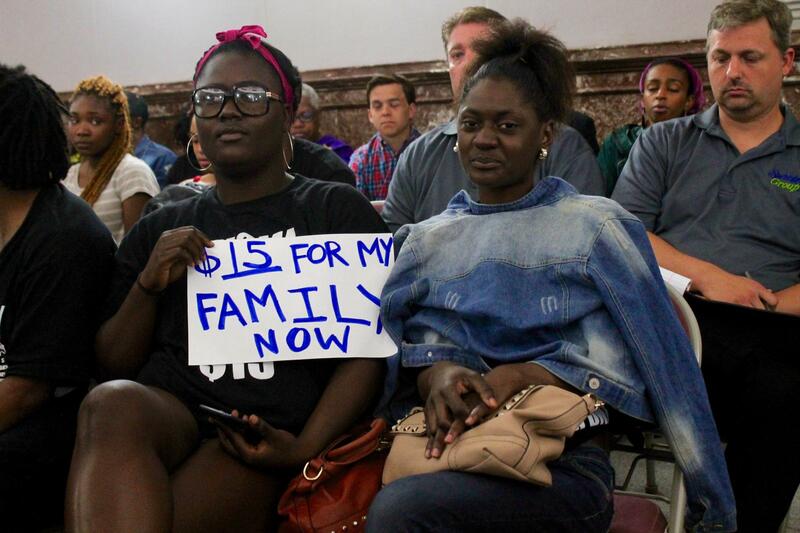 Supporters of raising St. Louis' minimum wage listen to testimony earlier this year at St. Louis City Hall. Earlier this year, St. Louis Mayor Francis Slay and supportive aldermen threw their support behind Alderman Shane Cohn’s effort to raise the city’s minimum wage to $15-an-hour by 2020. But the legislation ran into procedural snags, culminating in the bill being tabled before aldermen started their summer break. The bill would raise the city’s minimum wage to $8.25 an hour on Oct. 15, 2015. On Jan. 1, 2016, the city’s minimum wage would go up to $9. It would then increase by a dollar every year until it gets to $13 an hour by 2020. 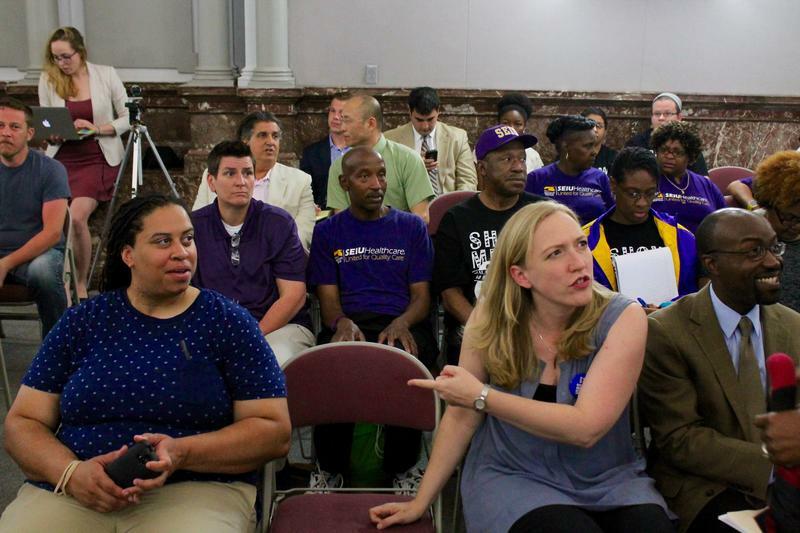 Alderwoman Megan Green, D-15th Ward, said supporters of the minimum wage increase have been working behind the scenes to craft legislation that can make it to Slay’s desk. Reed had spoken out against several exemptions that were attached the bill, and Green said many of them have been removed. 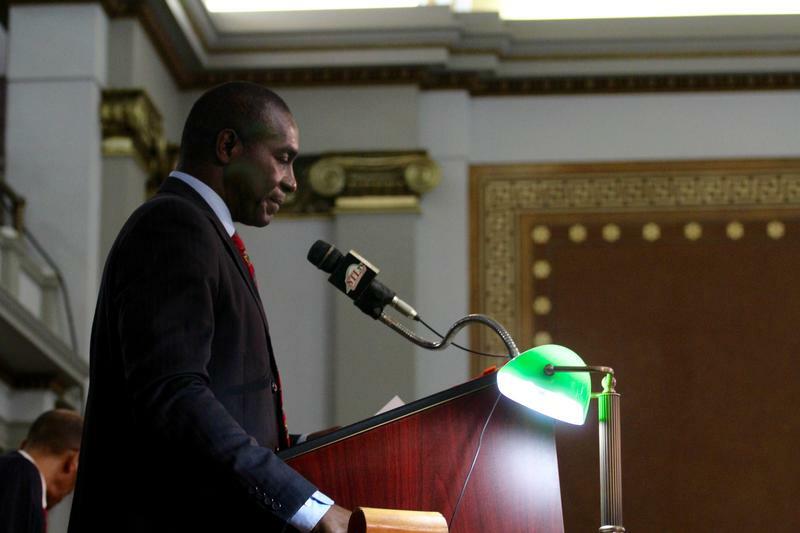 St. Louis Board of Aldermen President Lewis Reed helped call the Board of Aldermen back into session to debate the minimum wage hike. Aldermen may have to act relatively quickly because of state legislation known as HB 722. That legislation bans local minimum wage increases, but includes a provision that states the bill does “not pre-empt any state law or local minimum wage ordinance requirements in effect on Aug. 28, 2015.” Supporters of the St. Louis minimum wage increase believe that if they can pass their bill by Friday, it wouldn’t be voided if a veto of HB 722 is overridden. Green said the bill would go into effect immediately to conform to HB 722. She’s “absolutely comfortable that we have the votes to pass this," she said. The city’s minimum wage push has the support of some labor unions and activists groups. Rasheen Aldridge, a member of the Ferguson Commission who’s been active in the movement raise the minimum wage, said he was enthused that aldermen were coming back into session to deal with the issue. 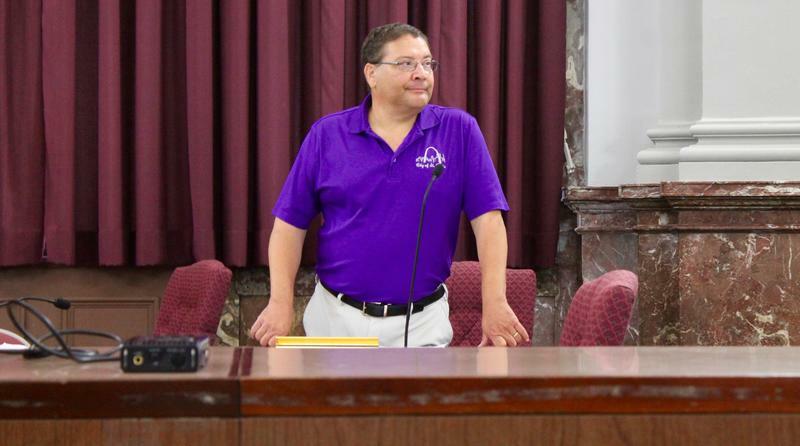 Alderman Joe Vaccaro, D-23rd Ward, plunged the future of a minimum wage bill into doubt after canceling committee hearings on the issue. “Raising the minimum wage is an issue of basically giving families the ability to live without having to live check to check,” Aldridge said. “And right now people have to live check to check, because the minimum wage is so low. And raising it would finally be able to have families that can breathe a little bit. Aldridge’s slight trepidation could be a reference to the likely strong opposition to the wage hike from some aldermen. 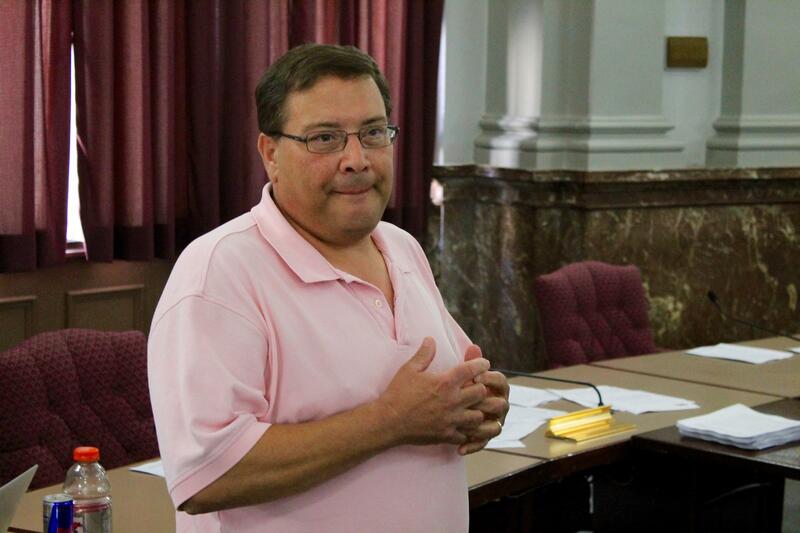 Alderman Joe Vaccaro, for instance, said he’s ready to offer roughly 15 alternate versions of Cohn’s bill — and expects some of his colleagues to suggest more changes. The 23rD Ward Democrat scrapped hearings on Cohn’s bill earlier this summer, a move that threw the measure’s future into doubt. Vacarro questions whether a $13 an hour minimum wage increase has the votes to pass — and expects the measure to face strong opposition. The legislation also fostered opposition from some business owners and business groups. Hart Nelson of the St. Louis Regional Chamber said passage of the bill would create uncertainty for businesses. “This will absolutely face litigation because it is unlawful,” Nelson said. “And so all of that is going to create increased uncertainty for employers who are trying to plan how they can grow, how they can expand. For employers who are considering moving to the city, this is something that is going to be very uncertain for a period of years. And that’s going to cause problems for the economy. Nelson said it could place city businesses at a competitive disadvantage since St. Louis County isn’t following suit with a wage increase. Green says the bill's supporters are hoping to initially passed the bill on Tuesday and then come back on Friday to give final approval to the measure. And while supporters and opponents of raising St. Louis’ minimum wage don’t agree on much, both believe that Tuesday’s Board of Aldermen meeting on the topic won’t be resolved that quickly. “I would be very, very surprised if we were done by 11:30 a.m.,” added Green, with a laugh. Amid an increasing tide of gun violence throughout St. Louis, the president of the Board of Aldermen is trying to organize a gun buyback program. St. Louis Board of Aldermen Lewis Reed told St. Louis Public Radio earlier this week that he’s setting up a gun buyback program through a crowd-funded site known as Gun by Gun. While the site isn’t operational yet, the idea is to get St. Louis residents to trade in their guns for money received from crowd-funding.